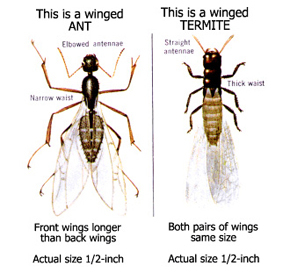 What is the difference between a termite and a flying ant? Termite wings are all equal in length and extend well past the abdomen. However, ants have wings which are unequal in length and generally end at the tip of the abdomen. Antennae on termites are straight and beadlike, but on ants they are elbowed. Ants have a pinched waist (abdomen), but termites have no constriction in the body and are more streamlined. This site powered by JnJ Technologies.